RYAN ‘THE FLASH’ GARCIA SCORES UNANIMOUS DECISION VICTORY AGAINST JAYSON ‘LA MARAVILLA’ VELEZ TO EARN NABF AND NABO SUPER FEATHERWEIGHT TITLES ON GOLDEN BOY BOXING ON ESPN AT STUBHUB CENTER IN CARSON, CALIF.
AT STUBHUB CENTER IN CARSON, CALIF.
CARSON, CALIF. (May 4, 2018): Ryan “The Flash” Garcia (15-0, 13 KOs), the 2017 consensus prospect of the year and pride of Victorville, Calif., scored a unanimous decision victory against seasoned Puerto Rican contender Jayson “La Maravilla” Velez (26-5-1, 18 KOs) to win the NABF and NABO Super Featherweight Titles on a very special May 4 edition of Golden Boy Boxing on ESPN in front of a crowd of 6,625 boxing fans at StubHub Center in Carson, Calif. After a hard-fought ten rounds of action, Garcia won with three scores of 99-91. In tonight co-main event, Gary “Spike” O’Sullivan (28-2, 19 KOs) scored a third-round technical knockout victory after Berlin Abreu (14-2, 12 KOs) of Rio Pierdas, Puerto Rico retired on his stool. O’Sullivan was aggressive, cut the ring, and landed hard hooks to the body and head in this middleweight fight that was initially slated for 10 rounds. Seniesa “Super Bad” Estrada (13-0, 3 KOs) defeated Amarilis Adorno (1-7) of Vega Alta, Puerto Rico via third-round technical knockout in a flyweight battle initially scheduled for six rounds. Estrada cut Amarilis with a punch in the second round and punished her for most of the third. The cut eventually forced the referee to end matters at :38 of the third round. Marvin Cabrera (8-0, 6 KOs) of Mexico City, Mexico scored a third-round technical knockout victory against Wilfrido Buelvas (18-9, 12 KOs) of Apartado, Colombia in a scheduled eight-round middleweight clash. Though taking some serious shots in the first round, the southpaw Cabrera gradually wore Buelvas down, stopping him at 1:11 of the third round. Richard “Kansas Kid” Acevedo (2-0, 2 KOs), the rising super welterweight prospect of Los Angeles, Calif. scored a first-round knockout win against Edward Aceves (0-4) of Pomona, Calif. Acevedo, who is originally from Garden City, Kansas, punished Aceves to the head and body before forcing the referee to stop the fight :59 of the first round. The fight was initially scheduled for four rounds. Garcia vs. Velez was a 10-round fight for the vacant NABO and NABF Super Featherweight Titles presented by Golden Boy Promotions. The event was sponsored by Tecate, “THE OFFICIAL BEER OF BOXING” and Hennessy, “Never Stop, Never Settle.” The fights took place on Friday, May 4, 2018 at StubHub Center in Carson, Calif. Photos and videos are available to download by clicking here or copying and pasting link: http://bit.ly/GarciaVelez into a browser. Credit must be given to Golden Boy Promotions for photos and videos used. For more information, visit www.goldenboypromotions.com and http://www.espn.com/boxing/; follow on Twitter @GoldenBoyBoxing, @OscarDeLaHoya, @ESPN, and @ESPNBoxeo; become a fan on Facebook at www.Facebook.com/GoldenBoyBoxing; and follow on Instagram @GoldenBoyBoxing and @OscarDeLaHoya. Follow the conversation using #GBPonESPN. 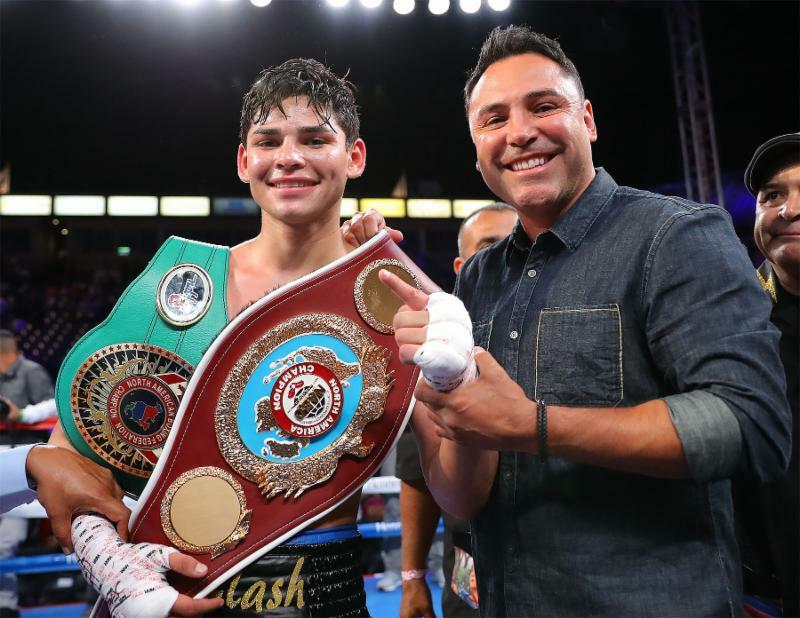 Previous Ryan Garcia passes test versus Jayson Velez, BUT….